JD (U) leader Nitish Kumar was sworn-in as the chief minister of Bihar for the sixth time on Thursday after again striking an alliance with the BJP, barely hours after tendering his resignation as he parted ways with the RJD. And all this happened in less than 24 hours. 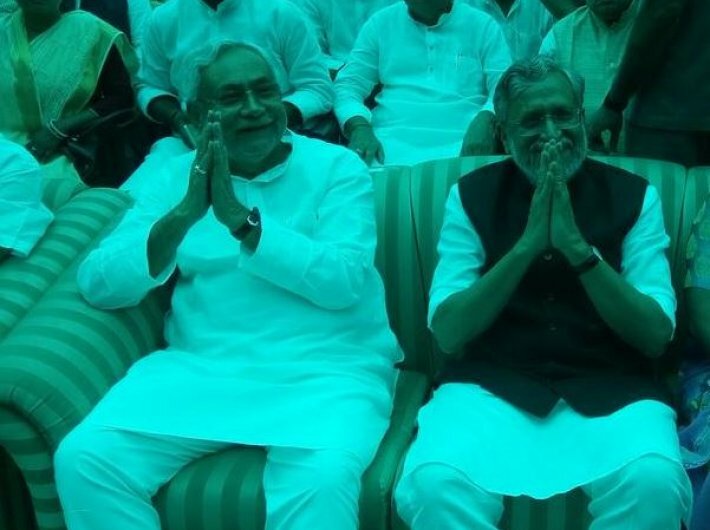 BJP’s Sushil Modi became the deputy chief minister. With this, the JD(U)-BJP return to power after four years in the state. Nitish Kumar led JD(U) had walked out of the NDA in July 2013 after Narendra Modi was nominated as head of the BJP's campaign committee for the 2014 Lok Sabha polls. A livid Lalu Prasad said on Thursday: “There had been a setting with the BJP.” He added that the prime minister’s congratulatory tweet had proved his point. Modi’s tweet had been discussed threadbare on the social media on Wednesday night as it was perhaps for the first time that a prime minister was congratulating a leader from another party for stepping down as the chief minister. A stunned Congress saw power slip through its fingers. The JD(U), RJD and the Congress had come together in 2015 to form the mahagathbandhan, which now lay in tatters. RJD had won the maximum 80 seats, with the JD(U) a close second with 71 seats. The BJP and its allies bagged 58 seats. For the past few weeks, political trouble had been brewing in Patna following a case being registered against Lalu Prasad, his wife Rabri Devi and now former deputy CM Tejashwi Yadav on allegations of corruption during his tenure as railway minister in 2006. The investigation agency had conducted raids at more than 12 locations, including their houses in Delhi, Gurugram, Patna, Ranchi and Puri. The JD(U) had been demanding that Tejashwi Yadav must resign. The demand was, however, categorically rejected by Lalu and Tejashwi. Nitish Kumar has been in and out of power in Bihar, with his first stint in March 2000 lasting just a week. An alliance with the BJP brought him back to power five years later. But, the problem lay in the fact that though he wanted its support, he didn’t want BJP’s Hindutva politics. The 17-year-old alliance came to an abrupt halt after the BJP chose then Gujarat chief minister Narendra Modi as its face for the 2014 Lok Sabha polls. The break-up proved to be a political hara-kiri, with the JD(U) getting only two seats out of the 40 Lok Sabha seats in the state. Nitish quit and picked Jitan Ram Manjhi as his replacement. Things did not work out and Manjhi was expelled from the party. Nitish Kumar has also played his innings at the centre. He was elected to the Lok Sabha for the first time in 1989 and went on to win five parliamentary elections from Bihar. He has twice been the union railway minister.